TO CREATE THE CRUST: Combine the flour and salt in a large bowl. Add the lard and rub it into the flour with your fingertips until the mixture resembles course crumbs. Add the agg, water, and vinegar and stir with a fork until the dry ingredients are moistened. Form the fough into a ball and divide that into three balls. Form a ball into a disk and roll it out to a ⅛-inch thickness on a floured surface. FIT the first dough disk into a 9-inch pie pan and trim the edges to a 1-inch overhang. Fold the dough under and crimp the edges. Keep the second disk (top crust) aside. Form the remaining ball of dough into a thick disk and place in a resealable plastic bag to freeze for up to 3 months. COMBINE all of the filling ingredients in a large bowl until well blended. Spoon the fruit filling into the piecrust. Use some water to wet the rim of the bottom crust, which will help both crusts adhere together. 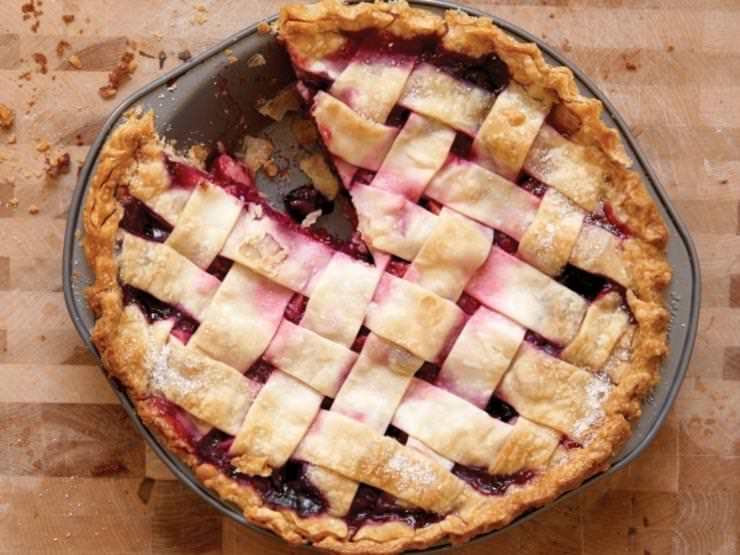 Cover the pie with the top crust and crimp the crusts together all the way around. Make three slits in the crust. Sprinkle the top with a little sugar. Bake for 15 minutes, and then decrease the heat to 325°F and bake for another 30 minutes, until the crust is golden and the fruit filling begins to bubble out through the slits. Cool on a wire rack or windowsill until the pie is firm, about 45 minutes. Store any leftovers in a sealed container. The pie will keep for about 5 days.